For the first time in over three and a half centuries, the story of people of African descent in the colonial Bronx, the northernmost borough of New York City, is being told. Discovered in over fifty scattered places, 210 separate accounts written by participants and witnesses from 1664 to 1783 in letters, government documents, court records, wills, memoirs and newspapers are brought together in one volume for the first time. 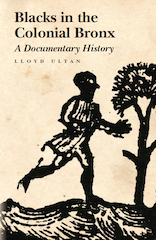 The noted historian and author, Lloyd Ultan, puts these statements and accounts from the era into context, telling what they mean and tying them all together in a revealing narrative.